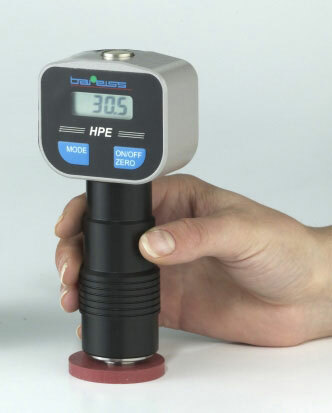 The HPE Digital version of our Yarn Package Durometer has additional advantages. Prisms can be added onto the test stamp, making it easier to measure on spools with different dimensions. Our Test Stand is a perfect device for serial tests and serves for lifting the manual Yarn Package Durometer. The pick-up device allows a quick and easy clamping. The measuring result can be obtained without subjective influences because of this constant load. It allows absolutely exact and reliable determination of the winding density.